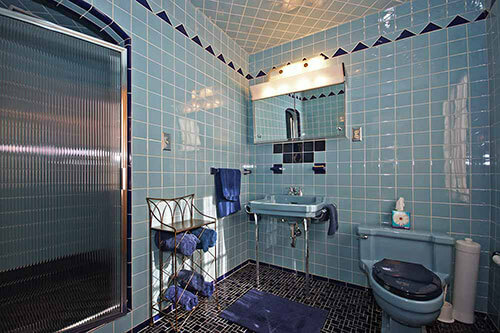 Home » Mid Century Culture » 1950 time capsule house with 7 vintage bathrooms — Grosse Point Park, Mich.
An email tip from reader Anne led us to this stunning time capsule house in time capsule house in Grosse Pointe Park, Michigan, which is listed for sale by Kay Agney from Higbie Maxon Agney Realtors. (Trivia: GPP is yet another city where Pam has lived.) This stately house is a stunner indeed. And if you were in disbelief at our recent Portland, Oregon, house with five vintage pastel bathroom, well, hold on to your hat, because this Michigan beauty counts seven — yes, that’s seven — vintage pastel tiled bathrooms. 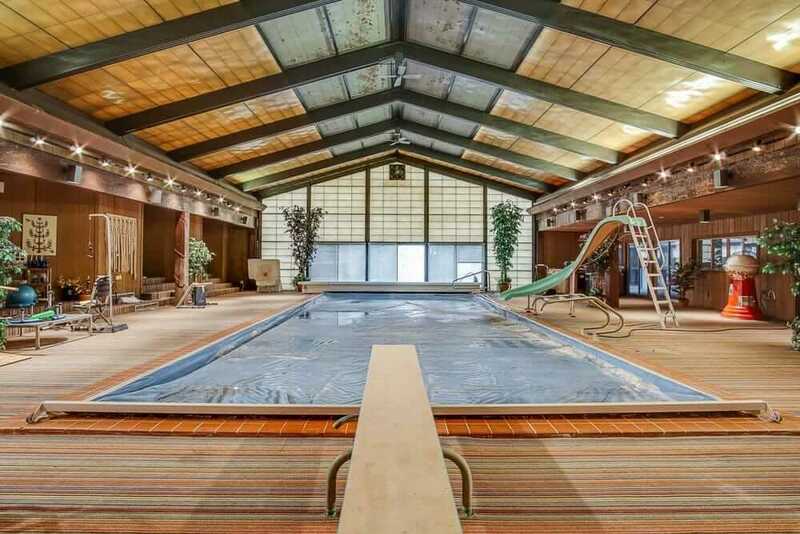 (The listing says it has six because they can not technically count the bath in the basement, we are told.) 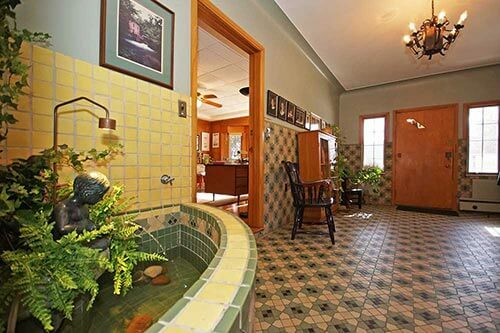 Other exciting details in the house are a garden entryway with an amazing vintage tile fountain and coordinating patterned tile on the walls and floors, a curved staircase and several fantastic retro rec rooms. Thanks to Matti from Mixed Media, we have both wonderful photos of this property and a very extensive video tour (link now gone) to drool over, too. 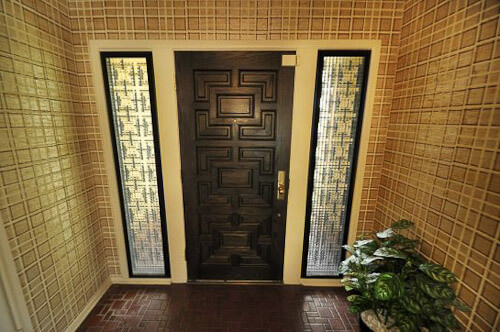 Not only does this house have unique details — but it also has an interesting history — involving a possible secret passage. 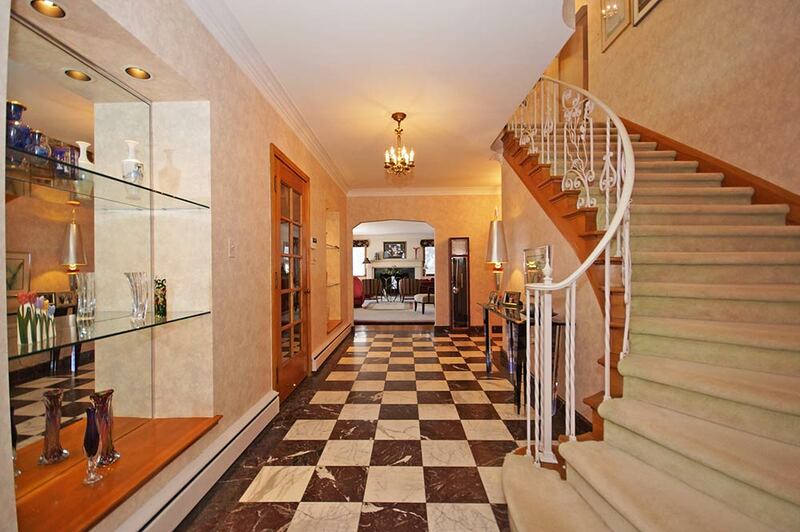 This fabulous and lovingly maintained Georgian Colonial features an interesting history! 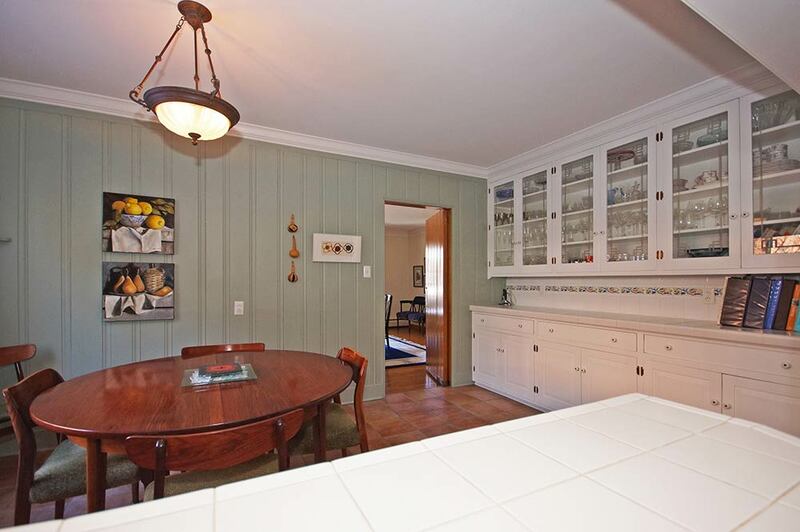 The updated kitchen will delight any chef, the spacious bedrooms have private baths, and the 2nd floor family room offers a wet bar and bath! 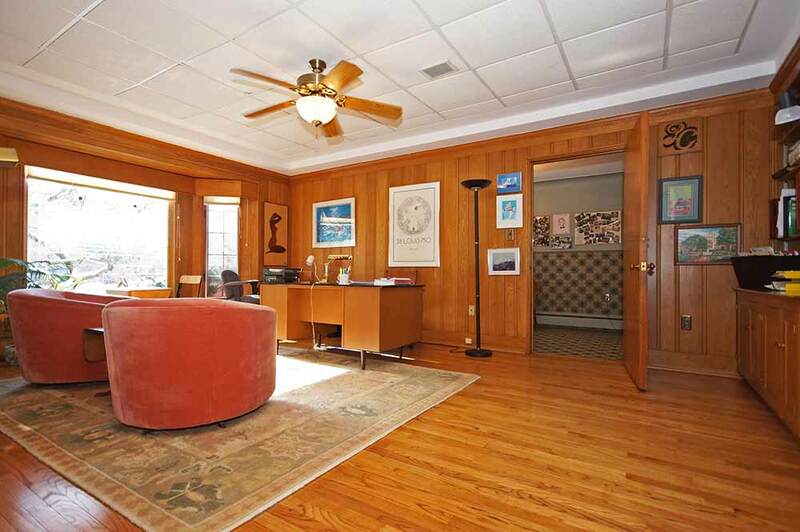 Paneled library, garden room with a fountain, and beautiful grounds are only the beginning! 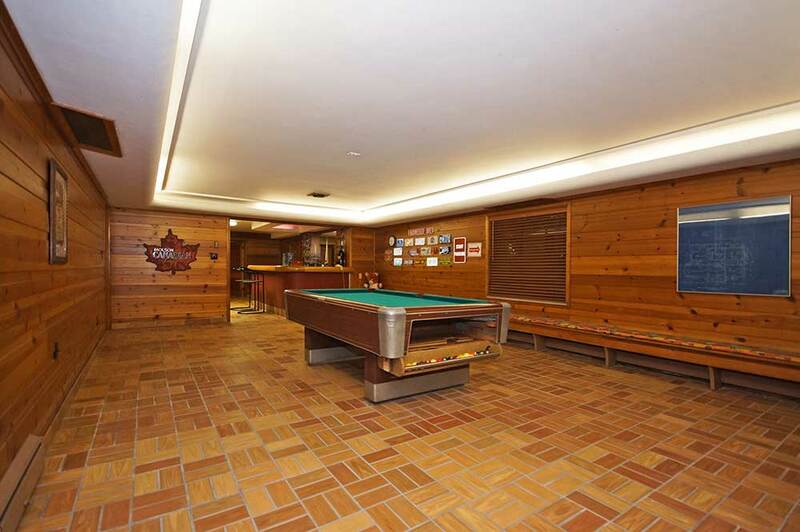 Finished lower level with wine cellar, rec room, 2nd kitchen and 6th full bath! Extensive use of Italian marble and custom tile! 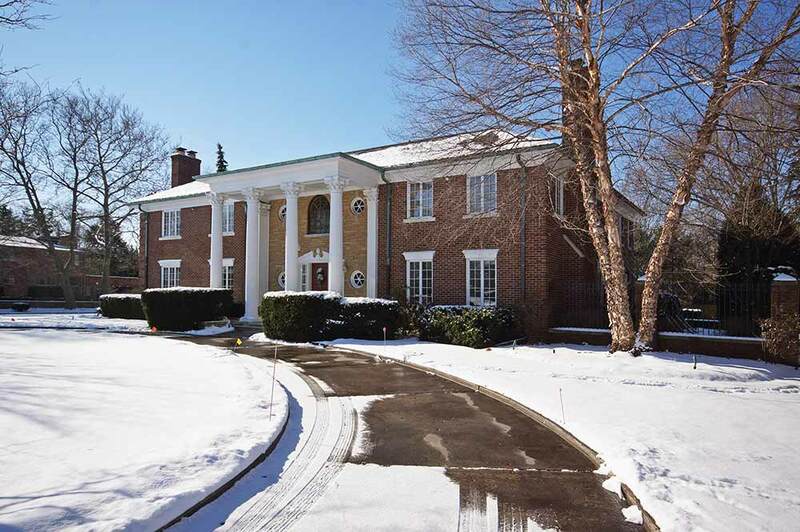 Located on a Boulevard one block from elementary school! 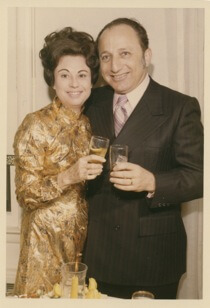 The current owners are the fifth owners of the home — and over the years, they have continued to restore and maintain this beautiful property. We are pretty darn sure in our guess that the tile and fixtures in all the bathrooms are original. Look closely — three of the bathrooms have tile covering not just the walls and floor, but also the ceiling. 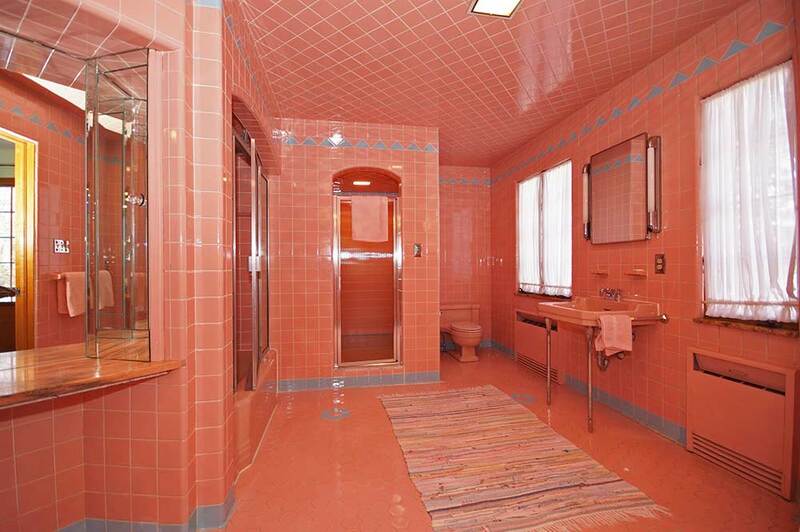 The pink bathroom has a shower, tub and a dressing area. 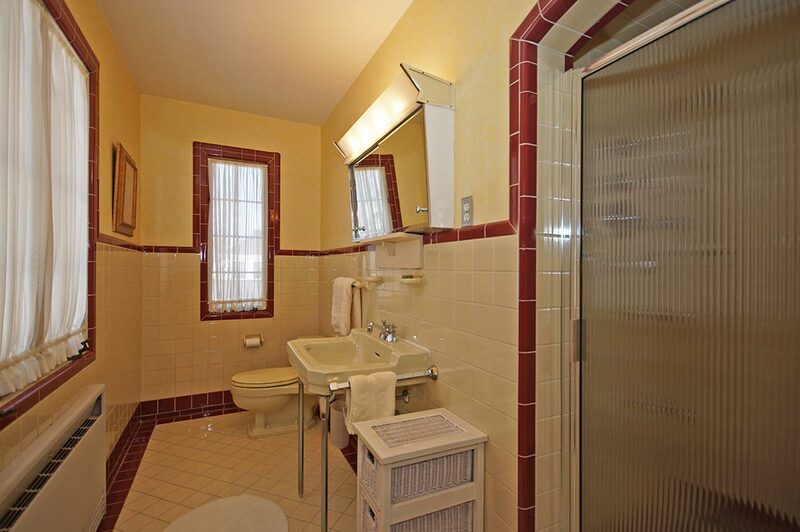 The profile of the mirror/medicine cabinet in this white and burgundy bath is awesome — and the tile so nicely edges the room’s windows and floor. Here’s a combination we don’t see every day — a vintage maroon and grey tiled bathroom where maroon is the main color. 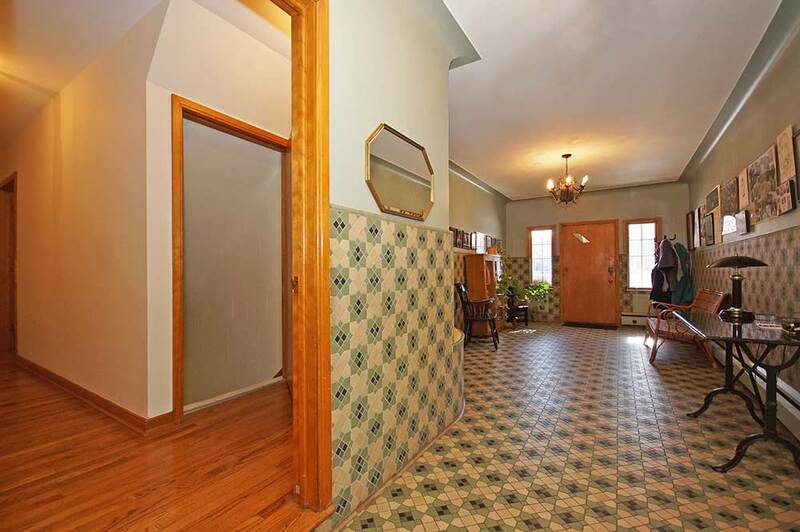 The hex tile floor with flower motif is so charming. By the time we get to the 7th bathroom — all the colors must have been used up. Even though it is only white on white — the basket weave tile floor adds interest. 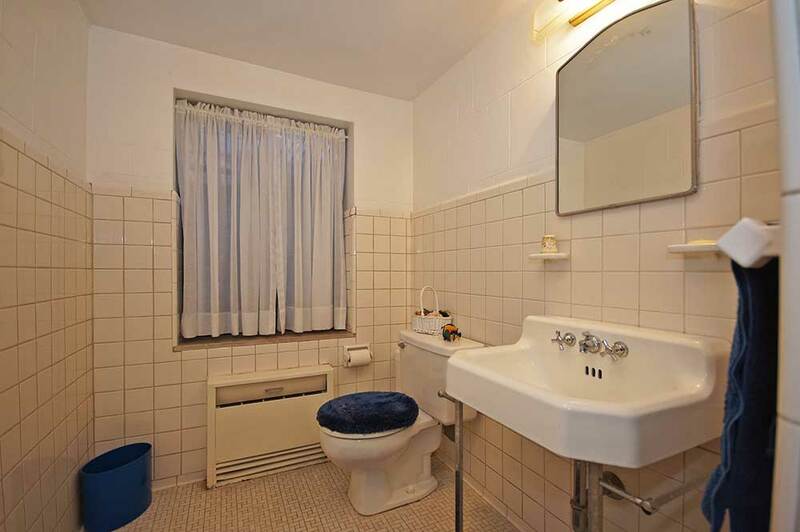 We’ll hazard a guess — housekeeper’s bathroom? 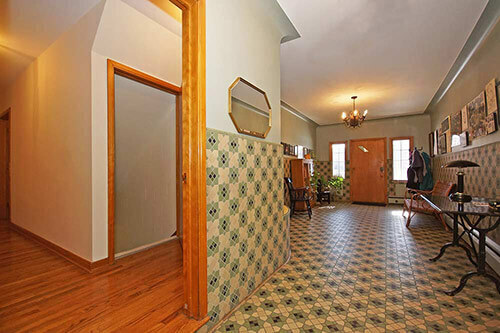 If the seven vintage ceramic tile bathrooms didn’t impress you — this tile entryway — dubbed “the garden room” sure will. Detroit is home to the famous Pewabic Tile company. 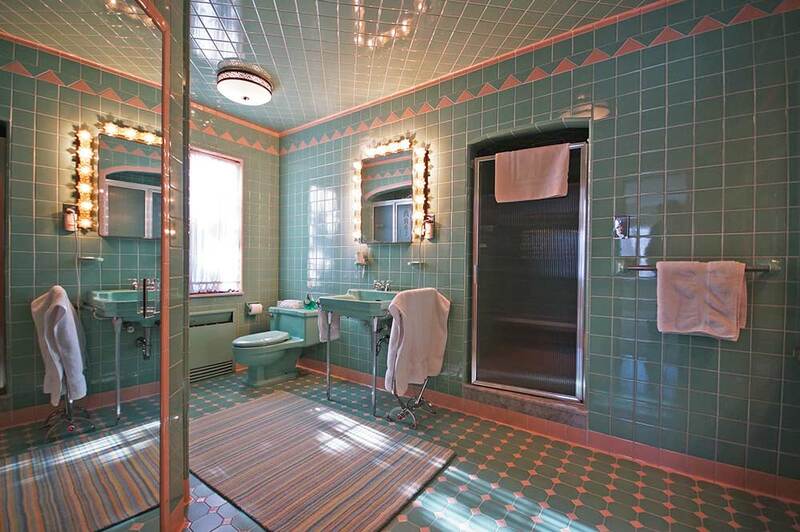 We wonder if this is Pewabic. Just look at the beautiful pattern on the walls and floor — and then there is tile work on the fountain — amazing. Also of note — this game room with inset linoleum flooring in a fun argyle like pattern. 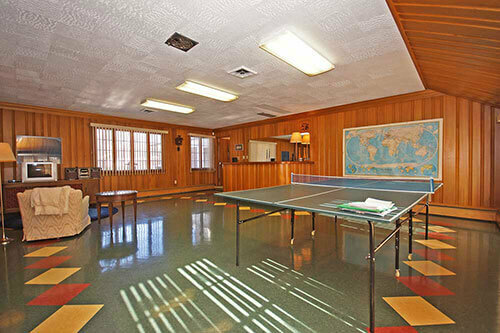 The warm fall colors are a wonderful complement to the wood paneling on the walls — we’re ready for a Ping Pong tournament, for sure! 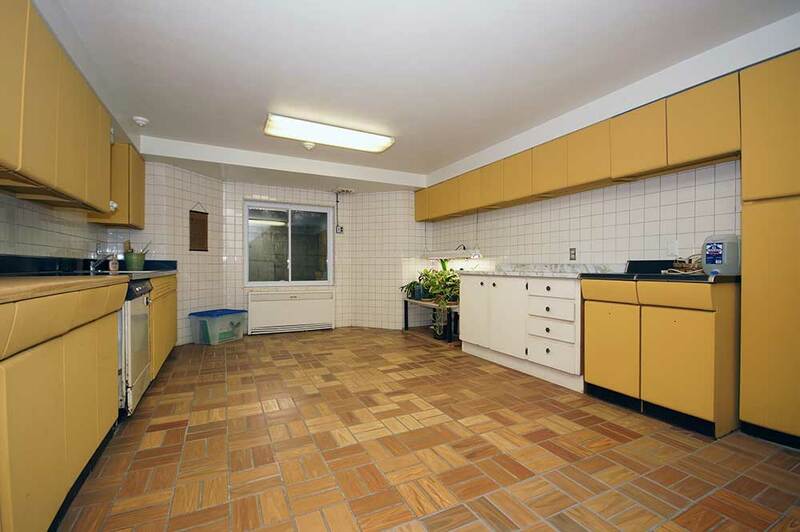 Just when you thought the surprises were over — check out this vintage yellow steel kitchen in the basement. 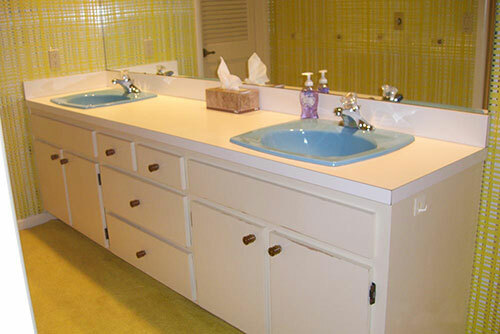 Pam calls these as: American Brand cabinets — if you squinch your eyes, you can see the hold in the center of the base cabinet doors where the cabinet pull went. 52PnB, do you agree? 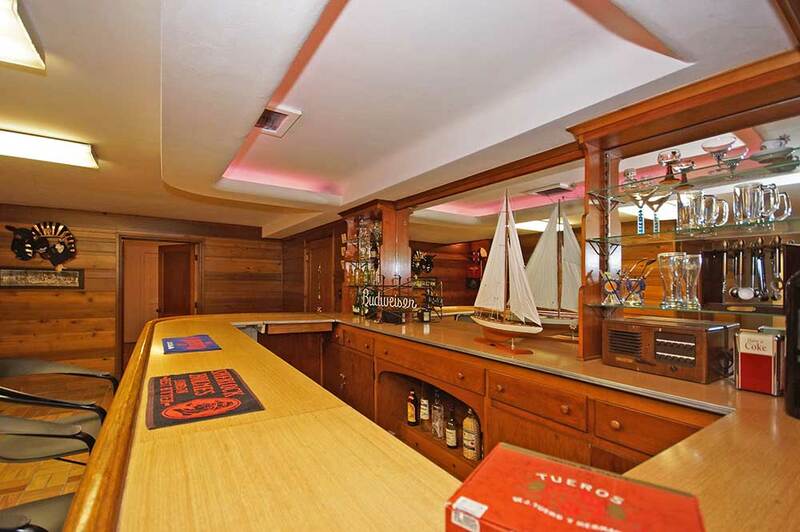 Mega thanks to Kay Agney from Higbie Maxon Agney Realtors for allowing us to feature this wonderful property… to Matti from Mixed Media for allowing us to feature his photos and video of this truly beautiful time capsule house… and to reader Anne for the time capsule tip. Honestly, readers, you are just the greatest with all these tips — keep them coming! ? If you are interested in learning more about this property, contact Kay Agney: office (888) 886-4060 or email her at kay@higbiemaxon.com. 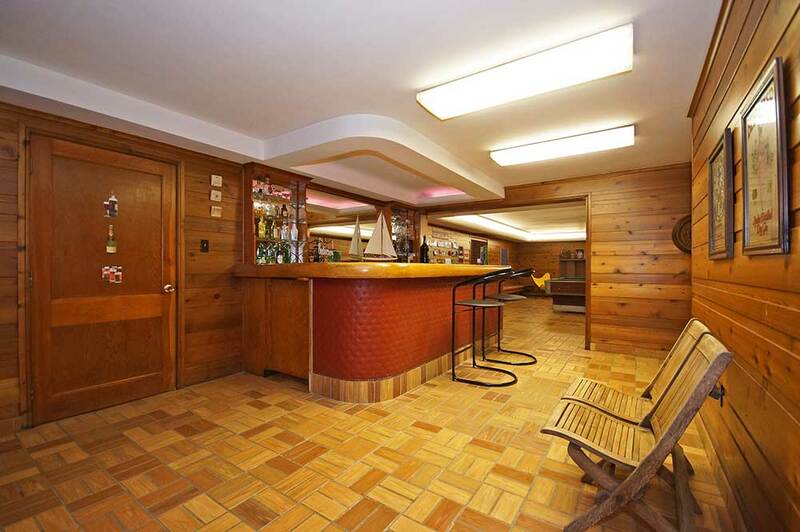 I am dying over the basement floor!!! Love it! 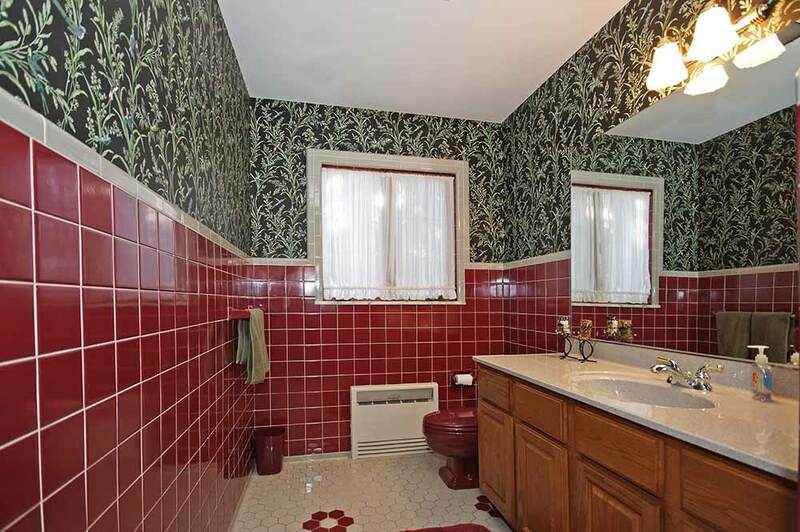 Loving how tile covers the ENTIRE room on a few of these. 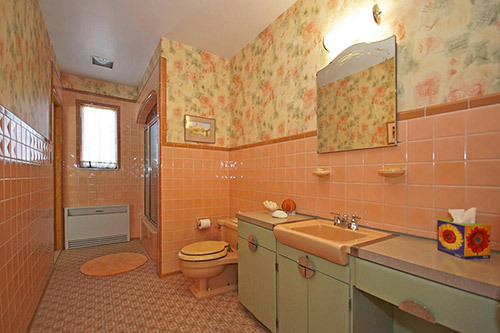 Like Mylar wallpaper did for bathrooms 25 years later.